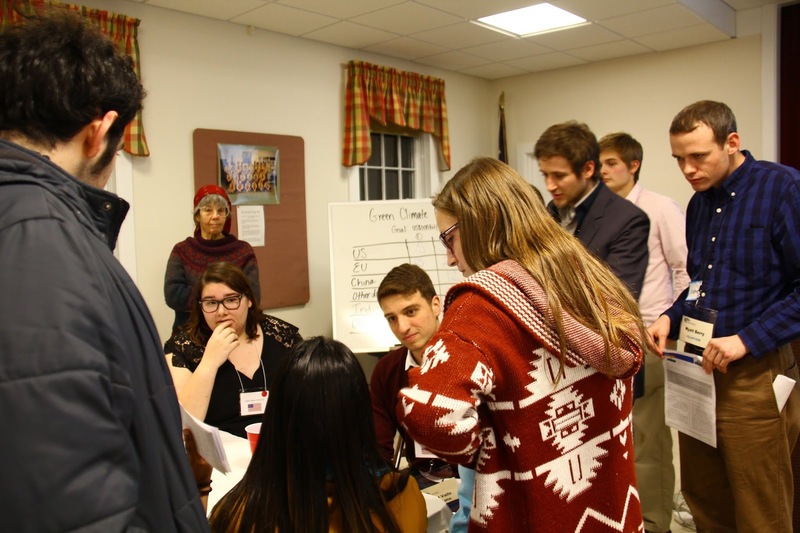 The World Climate Simulation is an activity developed by Climate Interactive in which participants take on the role of a country leader and work in teams to negotiate an international climate change agreement akin to the Paris Agreement. 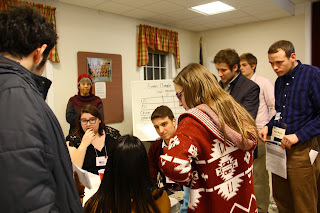 The simulation is a fun and exciting way to share our experiences at the United Nations climate change negotiations with classrooms and community groups across Maine! Our next program for the public is on May 9 at the University of Maine Hutchinson Center in Belfast. We hope you can join us! Negotiate an International Climate Agreement at the Hutchinson Center! Come enjoy a fun evening of interactive learning about climate change. From novice to expert, all are welcome! We will serve a light supper. Registration: While registration is not required, let us know if you can come by contacting Michelle Patten, 338.8002, michelle.patten@maine.edu. This will help us to plan for food and materials. What to bring: Just you, your friends, and a bowl for vegetarian chili! What do we do during the activity? The program is centered on an interactive role play activity. At the beginning of the evening, each person will join a country group which will be the group you represent for the whole activity. After joining your group and meeting the other participants, the facilitators will give a 35 minute presentation about climate science, the role of the United Nations in addressing climate change, and the way the negotiations will work during the activity. After that, the role play begins. We provide all the information you need to make decisions, so there is no need to prep ahead of time. Using your group's information, you talk within and across the groups to come up with the details of a global climate agreement. It's fun--and the time flies. We promise! Anna McGinn, Will Kochtitzky, and Molly Schauffler will facilitate the Hutchinson Center program. Anna and Will are graduate students in the Climate Change Institute at the University of Maine, and have attended and conducted research at 6 of the last 8 annual United Nations climate change negotiations. McGinn is studying climate policy, and how people are adapting to the impacts of climate change at the international level and at a local level using case studies in Nicaragua and Samoa. Kochtitzky is studying why glaciers in Alaska become unstable, how they are responding to climate change, and why they contribute more to sea level rise than any other group of mountain glaciers on Earth. Schauffler coordinates science programing at the Hutchinson Center, and works with middle and high school teachers to improve data literacy and climate education. Do I need to know about international climate change agreements to participate? No! We encourage everyone to attend no matter your familiarity with the topic of climate change. The program is set up so that people new to the topic can learn a lot and fully participate! 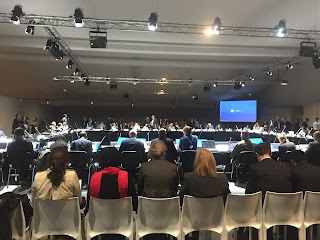 If you want to learn more, you can check out this blog which includes posts by the University of Maine delegation that attended the most recent UN climate meeting in Poland in December 2018. I work in the field of climate change, will I get anything out of this activity? Yes! 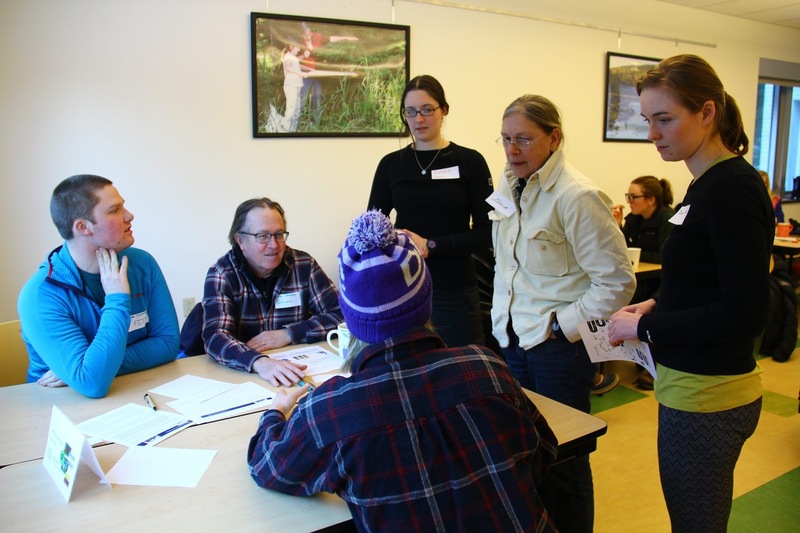 The first time we ran the program was with 20 graduate students and professors at the University of Maine Climate Change Institute, and they loved how the activity helped them to see their topic of study in a new way. We hope the program is set up to do that for everyone regardless of your specialization! We have run the program with students as young as 7th grade, and they love it. Kids younger than 7th grade will be paired with their parent or guardian in order to get the most out of the activity. Can we come for just part of the program? You will get the most out of the program if you are able to attend for the entire event as the material and the activity build upon itself. However, if you come a little late or need to leave a bit early, that's okay! Do I need to be affiliated with the University to participate? Absolutely not! This is a community event, and we encourage everyone to attend! Do you have other questions about the program? Please feel free to contact us at anna.mcginn@maine.edu. Welcome to UMaine's COP24 Blog! From December 2-14, 2018 our UMaine delegation will attend the United Nations climate change negotiations--referred to as COP24. This year, the negotiations will take place in Katowice, Poland. We are excited to keep you up-to-date on the negotiations, our research, and other goings-on over the course of the two week conference. COP is a place of many themes and many frames. People from all across the world come to discuss the most pressing issues in climate and environmental policy. At COP24, one theme in particular has been dominant: the IPCC Special Report on 1.5 Degrees Celsius as a warming-cap goal (to be referred to here on out as SR1.5). The mainstream media may be better acquainted with this report as the "...there are only 12 years left to control catastrophic climate change..." document. Either way, the effect this recently released report has had upon the global climate policy sphere is undeniable. Hello Readers! My name is Alex Rezk, and I am a Doctoral Student in the Anthropology & Environmental Policy Program at the University of Maine, as well as a graduate student affiliate of the Climate Change Institute. 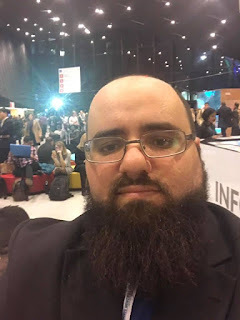 I am one of four representatives of UMaine attending the first week of COP24 in Katowice, Poland. While you can find more detailed bios for all of us delegates elsewhere on this site, we thought it would be good to introduce ourselves and our framing at the COP nonetheless during these first posts!